Murania Press » BLOOD ‘N’ THUNDER #45 Is on the Way! BLOOD ‘N’ THUNDER #45 Is on the Way! As of this writing the final subscriber copies of the latest BnT have been ordered and are being shipped directly from the printer. I got some of them in the mail before leaving for PulpFest, but most were ordered this week once I’d returned from Columbus and decompressed for a day or two. Those of you who don’t already have your copies can expect them in next week’s mail. The issue debuted at PulpFest — I had to get copies shipped overnight from the printer to get them in Columbus on time — where it was well received by attending subscribers and single-copy purchasers. So far, based on the very limited feedback I’ve received, my article on Famous Fantastic Mysteries seems to be the issue’s standout. 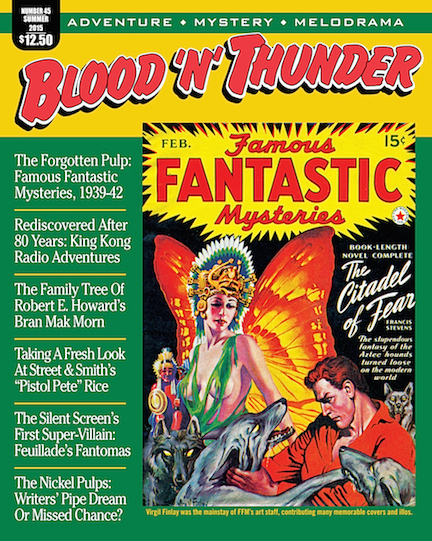 Ed says his article on FAMOUS FANTASTIC MYSTERIES “seems” to be the issue’s standout. In my opinion, there is no doubt about it, the article is the best piece in the magazine and since it is only part one, we will have the enjoyment of part two in the next issue. Part one is 20 pages on a great pulp; part two will probably be even longer.